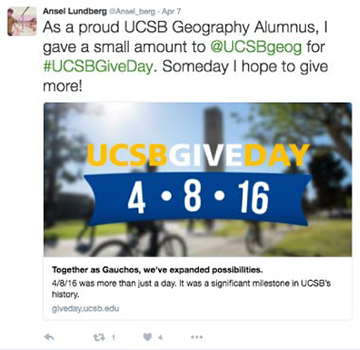 On April 8, 2016, thousands of Gauchos engaged on social media to celebrate UCSB’s first-ever Give Day. This was a milestone event for UCSB, marking the university’s campuswide debut into the digital space and an unprecedented outreach to its alumni community. On this single day, UCSB witnessed a 30% increase in new donors with alumni comprising 83% of this new contingent. These figures point towards a larger trend, towards a movement that is taking place at the university: alumni are reconnecting like never before and choosing to invest in their alma mater. Indeed for many Gauchos, Give Day was more than just a day. Gauchos are GLOBAL Through social media channels, Give Day sparked an ongoing dialogue between Gauchos and their university. Today Gauchos can stay connected like never before, dynamically engaging in our global network. Gauchos are SOCIAL Give Day revealed that UCSB truly matters to our Gaucho community whose Facebook and Twitter posts exceeded 100,000 on this single day. Gauchos are GENEROUS Give Day showed that the Gaucho spirit continues to thrive, inspiring 1,268 individuals to donate on a single day. Gauchos are TEAM PLAYERS Give Day exemplified the power of community: a day to prove that every contribution counts, and that this cumulative impact generates a force which can drive change. Gauchos are VISIONARIES Give Day was a collective movement that revealed a shared belief in the importance of taking action. No act of generosity is too small, and Gauchos took part in a Day that is sure to expand possibilities for future generations of Gauchos. To our Gaucho community, we extend a heartfelt Thank-you.